The Battle of Varrock Castle occurred in the year 169 of the Fifth Age, when Zemouregal the Mahjarrat stormed Varrock with a large army of undead, level 85 Armoured zombies from the Wilderness, as revenge for his failed attack on the city centuries ago. His aim was to obtain the legendary Shield of Arrav, a powerful artefact that was given to Arrav of Avarrocka by the Imcando dwarves in the Fourth Age to defend Avarrocka (today simply known as "Varrock") from the invading zombie forces of Zemouregal, who at the time already wanted to acquire the Shield. It seems that Zemouregal wanted the Shield in order to be better prepared when he assisted to the Ritual of Rejuvenation with his fellow Mahjarrat, as the Shield seems to have the power to protect its wielder from Mahjarrat magicks. The battle would also be a test of Zemouregal's new general, Arrav, who was cursed in the end of Zemouregal's first attack to the city to be destined to destroy the city he once fought so hard to protect (see The Legend of Arrav). The battle was short but bloody. Zemouregal's forces attacked the castle and overwhelmed it in mere minutes. Zombies gathered around the castle, fighting their way inside, where they ran amok and began to sack the castle in search of King Roald. In the courtyard, the castle's guards fought valiantly against the undead warriors, but were vastly outnumbered and overpowered, suffering heavy casualties while the zombie army took minimal damage. Warrior women inside the castle attempted to keep themselves and the palace's residents alive, and a line of guards were sent to the palace garden to protect Queen Ellamaria. At this point, an adventurer who had been working with Captain Rovin and the scout Hartwin, arrived back at the palace and attempted to stem the tide of undead. 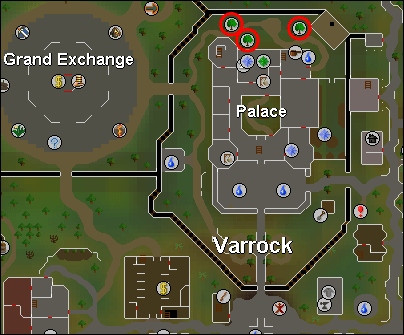 After killing several and getting information they needed, the adventurer set out into Varrock to find the heir of one of the Elders of Avarrocka in order to fully unlock the potential of the Shield of Arrav and vanquish the zombies once and for all. Fairly soon, the adventurer found that Dimintheis Fitzharmon was the heir he or she was looking for, and, wielding the shield, Dimintheis was able to turn back the zombies and save the city. Upon seeing this, Zemouregal quickly retreated to "the north" with Arrav and Sharathteerk (a Gargoyle that serves him as an ambassador and messenger), lamenting how he couldn't get his hands on the Shield before the incoming ritual. Most of the army. Numerous guards, a few warrior women. :s i don't get why this is posted tbh. how is it a guide? i figured this section of forums was more for in game guides like guides to pking, getting souls, etc..